GMS Med-e-lert helps to ensure that medications are taken properly and on time! 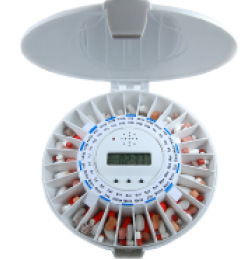 This fully automatic pill box dispenser is easy to setup and simple to use. The Med-e-lert pill dispenser has 28 compartments sized for 18 aspirin sized pills and has a 20% larger compartment size than other automatic pill dispensers. Its portable and ideal for in-home use or by caregivers in an assisted living facility. An alarm rings for 30 minutes or until pills are dispensed and it can be set up for 1, 2, 3, 4, 5, and 6 times daily with six dosage rings and the GMS has a loud alarm with a blinking light. Programming is retained in memory when batteries are removed or replaced. The Med-E-Lert is a pill dispenser, organizer and alarm all in one unit. Since there are 28 compartments it can handle up to 28 days of dosage. This can be prescription medications,vitamin supplements or over the counter products. A caregiver could even put a reminder note or a treat like candy in the compartment. There are no pill boxes to remove or lids to open. When the caregiver's pre-set time for the patient to take the medication comes the carousel rotates to the next compartment.The user just tips it over and the pills will slide out into their hand. An alarm will sound and a light will flash for 30 minutes till the pills are removed. This medication safety product eliminates double dosing or other medication errors. Keeping your loved one or patient safe and independent is all part of great caregiving. The independence can create a feeling of self esteem and not being a burden. How does the Med-E-Lert work. Watch the video on this page for a full explination. Can you set it for two times a day? YES- It will rotate to the next time and day set.You can set it for 28 times in one day if you choose to. How many pills does it hold? There are 28 compartment and each one can hold up to 18 aspirin sized pills. What type of Batteries does MED-E-Lert use? Simple to insert and inexpensive to buy, 4 AA batteries power the MED-E-Lert electronic pillbox. With average use, the battery life is 1 ½ years plus. Can the MED-E-Lert be used for vitamins and supplements? How does the patient know when to take a pill? There is a sound alarm and a flashing light that stays on for 30 minutes or until it is turned off.It will signal again at the next preset time. Is the Med-E-lert pill box portable? Yes, it is battery operated and batteries are included. Can it be used for any type of pills? Yes,it can be used for anything that fits into the compartment. Do you have to set it every week? No, you have a 28 compartment rotation which gives you more flexability with scheduling doses. Med-E-Lert pill dispenser has up to 6 daily alarms. Notice: this case is made of durable plastic & it does have a key lock, but with enough force it can be broken into. Do not purchase this unit if the person using it is known to abuse his or her medications. Med-e-lert is an excellent medication management tool for individuals with dementia or memory loss. Great for individuals with mental or visual impairments, or those with complicated medication regimens. At programmed times, the alarm sounds and a blinking light alerts the users for up to 30 minutes when medication needs to be taken. After 30 minutes or when the pill dispenser is tilted to dispense the pills, the alarm will stop. Med-e-lert is your dedicated personal medication manager, offering convenient, safe dispensing of daily medications. Purchased this for my mother with dementia. It has been a life saver as far as removing her anxiety over whether she has taken the right pills at the right time. She used to have pieces of paper and times written 4x / day and a pen to check off each time and she would get confused and scared she made a mistake. this provides a quick convenient solution and eases her mind. This product is excellent. We purchased it for our mother and it has given us peace of mind that she is now taking her medicines at the right times each day. Very easy to use after set up. this fell on the floor and did not break.Holds plenty of pills.Very safe. Bought this for my mother because she was always missing her pills and we were worried about her taking to many. This made it easier for her with a reminder and set our minds at ease knowing that she wasn't taking more than she was supposed to be taken..